While some JRPGs fuss over big hair and even bigger swords, others bust out hippies with dazzling teeth and bugs bearing dire warnings. There are plenty of games that suffer from tropes and clichÃ©s, but it can often seem especially bad in JRPGs, where you can hardly move for teenaged heroes destined to save the world and terrible foes wielding godlike power. In Issue 279 of The Escapist, Brendan Main says that this clichÃ©s are so prevalent, that when a game comes along that has a little fun with them, especially one as blissfully bizarre and wonderfully fun as Earthbound, the result is memorable, to say the least. EarthBound has all the trappings of a standard JRPG - the vague words about humble heroes and big destinies, the threat from beyond stirring otherwise simple folks to adventure. We've heard all this before. But set within an ostensibly normal suburb, even one as broadly fictional as Eagleland, the proceedings take on a certain verve. Instead of arming themselves with swords and shields, the neighborhood kids take up baseball bats, yo-yos and popguns to confront the extraterrestrial threat. Rather than slaying goblins and trolls, they face more urban fare - crazed cultists, deranged hippies, out-of-control taxicabs, and the occasional big pile of puke. Sometimes, EarthBound offers up straight suburban analogs for standard RPG mechanics - pretty soon, you'll become used to saving your game at telephones, or speeding around on bicycles from town to town. But often this change of scenery turns these assumptions on their ear, and forces the player to think twice. I know, for example, deep in the cockles of my heart, that a red slime is tougher than a blue slime. But what about an Overzealous Cop vs. a Cranky Lady? And how many HP does a New Age Retro Hippie have? 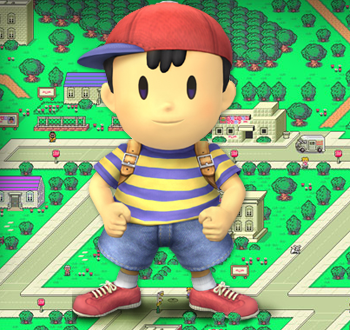 Earthbound has charmed players for years, not because it does anything new, but because it cleverly subverts the old. It retains the normal linear plot of JRPGs, for example, but does so with its tongue firmly in its cheek , sending the player to towns with names like Onett and Twoson. You can read more about it in Main's article. "Homeward (Earth)Bound."